Successfully Added Cell Phone Jammer with Painting Cover (CDMA+GSM+DCS+PCS+3G ) to your Shopping Cart. Do you know that the Mona Lisa in the Musée du Louvre is in fact a cell phone jammer? Of course I am kidding, BUT, with our Cell Phone Jammer with Painting Cover, you can turn your Mona Lisa at home into a jammer. 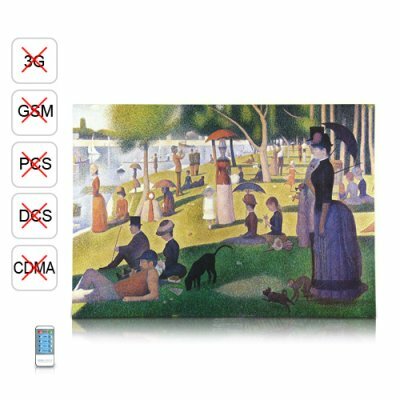 Cell Phone Jammer with Painting Cover, which allows you to customize the pictures, helps you covertly and completely block mobile phone signals in an 40 meter radius. This unique and high powered cell phone jammer is available in our warehouse now for single and bulk order purchases. Order today and we'll express ship it out tomorrow, brought to you by the leader in China Electronics - Chinavasion. Jams GSM, CDMA, DCS, PHS, and 3G signals - separately or all at once! I think my country does not have any specific laws against these devices, but I am still afraid that customs might seize the product. Can you list it on the packing label as a normal painting or something like that? What is the USB slot used for? Software updates and upgrades - keep an eye on this page for any available ones in the future. Is the signal blocking on this cell phone jammer only towards a specific direction (directional jamming)? Are there any other painting covers for this cell phone jammer? Not at the moment, but for those planning on making bulk orders, feel free to contact our customer support team for any available options. For now, feel free to add your own, just make sure the size is right.